My house never contained any kind of junk food. At least not within kid’s reach. Popcorn and a can of soda were reserved only for Saturday nights. Cookies and ice cream were for birthdays. Chips came from other friends at the lunch table. As a kid this is completely unreasonable. The house should be full of candy and snacks at all times for whenever I want them. Now, of course, I see that this kind of household has become more the norm with kids getting fatter and fatter. Thanks mom for not making me obese. So, my childhood home held any kind of delicious, artery clogging trans or saturated fats out of kid’s reach. It was also a household where my younger brother and I went to church school every Sunday morning. I am not a morning person. Ask anyone who knows me. If I wake up before the sun; don’t come near me. Going to church on Sunday morning was usually the last thing I wanted to do and the best way for my parent’s to get me to go – a bribe. And what could the best possible bribe be for a sugar and fat deprived child? Now, that was pretty much the only thing that got me out of my warm bed early Sunday morning to go to church. After our, what seemed to be forever, one hour church school session, my father would take my brother and I to Lord’s department store across the street from the church where we were allowed one succulent donut. Almost every time I would get the sweet and sour lemon donut. Powdered sugar, light and chewy dough, then a deluge of cool, tart lemon custard. I loved these after church donuts. It became a tradition and now, a special family memory. Donut bribes made church worth getting up for. And I could only assume that if I kept going to church, I would go to Heaven. And in Heaven, there were, of course, more donuts. When a restaurant makes this claim most dedicated foodies will either be suspicious or crowd in just to test its metal. However, when that restaurant also serves homemade donuts, it's more akin to a food free-for-all with 4 deep at the counter and a line out the door. 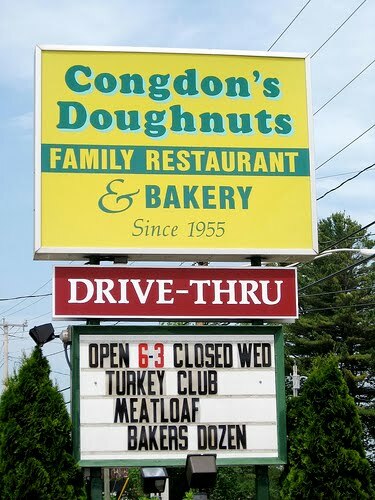 I give you Congdon's of Wells Maine. This is a shop so steeped in the local culture that even a gas explosion, which literally blew it off the map, couldn't keep the donuts from the masses. With 30+ different donuts, fritters, and a Whoopie pie the size of a small trampoline; this place is fun for the whole family! One this particular visit I brought the brother and nephew, who have now become die-hard fans. Note Ian's face, emotionless in mid-foodcoma, while Toby is alive with the glee of a 5 year old boy realizing he no longer needs to ask permission to buy another donut. On this special morning the boys found themselves in quite the donut dilemma. Mike had ordered 2, Toby 2 (including a fritter), and Ian 2 + a half dozen (these were for later). The astute girl at the counter, who was much better at math than the three of us combined, said "Why don't you just get 3 more for a bakers dozen?" We three stood and stared in a complete daze. 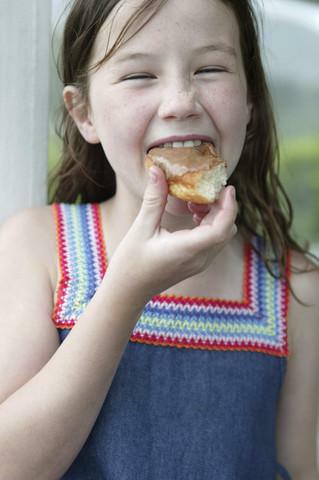 We knew she was suggesting we buy more donuts and somehow this might monetarily make sense however, between the brain cramping math and stomachs growling the only one thing we could determine for certain was that somehow we would be getting "MORE DONUTS". This, we grunted, was a good thing. That is of course until we sat down and Toby blankly stated..."Wait, how many donuts did we just buy?!!!" Thus ensued the trading session like that at the end of most trick-or-treats from back in the day; only now there's no Bit-O-Honey to off load on your little brother- these are donuts - and one things for certain...no matter how much coffee you haven't had, or whose got the quickest fingers, no one relinquishes a jelly stick from Congdon's without a fight! Brought to you by one of our loyal donut followers who is more interested in Boston Creams and Adobe Photoshop than his IT job...I give you the Donut Exodus. It seems while driving a particular section of Route 93 this morning hundreds of innocent motorists where spellbound by the site of a scrumptious Boston Cream donut espousing mind freeing words of wisdom. These motorists, unaccustomed to having their AM drive so peaceable interfered with, opted to forego the remainder of their morning commute and swarm local donut havens like lemmings to the edge of a cliff. I love my daily Metro on the morning train ride into work...of course, I love it more when it's coupled with a donut. What's even one step better is when the paper squeezes in a story about a donut. Who knew a summer travel story could so overtake me with glee that I couldn't help share with my donut loving cohorts? Granted having grown up on Cape Cod any respectable donut fanatic would excommunicate me for not having known about this sooner (I've only actually been to the Vineyard twice..shhh) but having been knee deep in academics in NH when the shop opened in 2001 I think a pardon is in order. The Martha's Vineyard Gourmet Café & Bakery opened in April 2001. And its menu boasts everything from fruit square to wedding cake to fritters and of course- DONUTS! They boast 2 locations, Oak Bluffs and. But only the Oak Bluffs site, which has been been a bakery for as long as most Vineyarders can remember, sells donuts. The trick at MV Gourmet is to get to the back door at night , 9PM-12.30AM, boasts sign, for some fresh hot, melt in your mouth morsels. Benjamin Hart, Metro contributor went so much as to say..."Its specialty is the apple fritter, a confection so addictive it should be illegal." Fortunately its not! Expect a full first hand report when I visit MV Gourmet later this summer. To say that I love donuts is an understatement. Let's just say a donut in my hand is a new appendage. The more I go on and the more small donut shops I visit the more I learn that the world if full of people just like me; we love us some donuts and we're damn proud of the local heroes who keep the oil hot and the dough frying. This blog is dedicated to finding those unsung local heroes that keep the shelves stocked 365, 24/7..or at least until the daily batch runs out. I don't mean Dunkin Donuts, Tim Hortons, Krispy Kreme, Honey Dew, or any of the large corporate chains. This is dedicated to the mom and pops and the people who never want to be out of reach of a delicious little doughboy.